Agumon is a fictional character from the Digimon media franchise. He is the Digimon partner of Marcus Damon (Masaru Daimon in the Japanese version) and a main character in the Digimon Data Squad anime series. Agumon usually calls Marcus "Boss" because Marcus takes care of and protects Agumon. This Agumon has a slightly different design to the original Agumon in Digimon Adventure. He is taller, with more teeth, longer claws, wider forearms and red training bracers. Where Digimon Adventure's Agumon had well-defined nostrils and pectoral muscles, this Agumon has just two oval-shaped holes on the front of his muzzle and a flat chest. He is also much larger than previous Agumon, being almost as tall as a human adolescent. A mistake can be seen occasionally where he has the original number of teeth of an Agumon. Agumon adores his partner Marcus, and considers himself to be "Marcus's employee" (follower in the original). He even refers to Marcus as his "Boss" ("Aniki" in original, meaning "brother" literally but meaning "boss" according to the Yakuza, therefore having the same connotations). In the first episode, he is referred to by the code-name of Raptor-1 by DATS. This Agumon in particular holds true to the given description of a common Agumon being somewhat aggressive. Being the main digimon character in the series, Agumon is always the first amongst the partner digimon to reach a new level. Unlike the other partner digimon in Digimon Data Squad, Agumon was easily accepted into Marcus' family when he was discovered, and is even given free reign of the Damon household. Marcus' Inner Strength! Although Yoshino tells Marcus that Digimon can only eat special Digimon food, Agumon tends to eat practically anything, including Marcus's mother Sarah Damon's fried eggs. Agumon's obsession with eating sometimes results in comical moments when Agumon (or Koromon, in one situation) attempts to eat Marcus's head. In the final episode, Marcus' DNA gives Agumon a new appearance. An outline of a dragon surrounds him, and he is given fiery bird-like wings and a dragon-like tail. In addition, Marcus can ride him, using straps attached to Agumon's wristbands to control his movements. Whether this is a super charge of Marcus' DNA or a new digivolution stage is unknown. Fans like to refer to him as "Agumon Burst Mode". Pepper Breath (Baby Flame): Agumon shoots an orange fireball of varying strength from his mouth. Spitfire Blast (Baby Burner): This attack uses a more powerful stream of fire than Pepper Breath. The name "Agumon" refers only to the Rookie form of this Digimon. Throughout the series, Agumon gains the ability to digivolve into a number of more powerful forms, each with a different name and special attack. However, the Rookie level is his preferred one and the one he spends most of his time in. Koromon is Agumon's In-Training form. The name "Koromon" derives from the Japanese word "Korokoro", meaning "something small, round, and rolling." He is a pink, ball-shaped Digimon with floppy ears, bright-red eyes and sharp teeth. He is approximately a foot tall. Agumon appears once in this form during the fight against Belphemon after hatching and attempts to eat Marcus's head, a reference to the Digimon Adventure movie, where the Koromon there does the same thing to Tai. This unnamed form is only seen against King Drasil, using which Agumon and Marcus Damon were able to defeat it in its true form. Like ShineGreymon Burst Mode, he glows a fiery red. He also grows a fiery bird-like tail and wings. Though no official name has been released, it is documented here as "Agumon Burst Mode" due to its aura akin to ShineGreymon Burst Mode's. GeoGreymon is Agumon's Champion level form. GeoGreymon's appearance is similar to Greymon, but with red markings on the sides of his helmet and arms, spikes on his shoulders, a more well-defined chest, a longer tail, and different body markings. GeoGreymon first appears during Agumon and Marcus's fight against a large Kokatorimon. This is when Marcus activated his DNA for the first time. Marcus was given his Data Link Digivice, and with it, he was able to help Agumon digivolve into GeoGreymon for the first time. After the first battle with Merukimon, GeoGreymon is often replaced by one of his digivolved forms so this form is used less and less in battle. Mega Flame: A steady stream of flames is spewed forth from GeoGreymon's mouth. Mega Burst: GeoGreymon forcefully ejects a powerful blast of energy from his mouth. Horn Impulse: A powerful, high-speed smash with his head. Trident Revolver: Fires three laser bullets from his revolver. Rising Destroyer: Fires a barrage of beams from the six guns on his wings and the two on his chest. ShineGreymon is Agumon's Mega form. 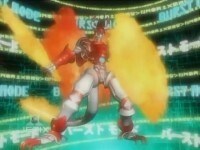 ShineGreymon is first seen during the fight against the Bio-Hybrids. Marcus' DNA super-powered RizeGreymon, causing a silhouette of ShineGreymon to appear around RizeGreymon. ShineGreymon was properly introduced in the next episode, along with MirageGaogamon and Rosemon after the Digimon Data Squad team learns how to harness this new power. ShineGreymon is crucial in Belphemon's destruction and Akihiro Kurata's downfall. Glorious Burst: Spreads his enormous wings and fires the light energy which he has concentrated to the utmost limit. Shining Blast: Uses the light shining from his wings to mow down the enemy. GeoGrey Sword: Summons the "GeoGrey Sword" from the underground to attack, though it must first be released by Marcus's DNA with the Digivice Burst. ShineGreymon Ruin Mode is said to be the corrupted form of his Burst Mode. The first time ShineGreymon changed mode, it was into Ruin Mode, a corrupted version of the true Burst Mode. This occurred during ShineGreymon's battle with MirageGaogamon when Marcus' dark emotions, fueled by his belief that his friend Thomas turned on them and joined Kurata, caused ShineGreymon to go through Burst Digivolution. ShineGreymon Ruin Mode went out of control until it regressed back to a Digi-Egg (which later hatches into Agumon's In-Training form, Koromon). Torrid Weiß (Deu: "Torrid White"): Repeatedly fires scorching hot flame-bullets. ShineGreymon Burst Mode is the burst digivolved form of ShineGreymon. Marcus manages to activate ShineGreymon's true Burst Mode in the battle against Belphemon, this time, ShineGreymon properly transforms into his Burst Mode and easily destroys Belphemon. Marcus activates his D.N.A. again during the DATS team's first encounter with the Royal Knights, allowing ShineGreymon to enter his Burst Mode again. However, this time, he is defeated by Gallantmon. He appeared later on facing the Royal Knight Craniamon in a one on one duel and was losing until the rest of the DATS arrived to jointly defeat the Knight. He last appeared in the final confrontation against King Drasil along with the other DATS Digimon. In the movie Digimon Savers: Ultimate Power! Activate Burst Mode! !, which is non-canon, ShineGreymon Burst Mode is the one who defeats the Mega form of Argomon. ShineGreymon Burst Mode appears in one of the rounds of Digimon World Dawn/Dusk's Legendary Tamer Quest, fighting alongside MirageGaogamon Burst Mode. Corona Blaze Sword: Combines his flame shield and sword into a new, far more powerful sword. Final Shining Burst: Uses every last bit of his power to create a great explosion.